The Queen Mary’s College team have started their 2016 Senior Students competition campaign, this year PE teacher and Tennis Team manager Sarah Goldson has entered two teams from the college, one boys and one mixed. The boys team of Saul Irwin and Cam Speirs have been joined by new college first year recruits Andrew Dingwall and Dan Hutchison. The boys got off to a shaky start losing their first match against Alton Sixth Form, who beat QMC in a shoot out last year in the penultimate knock out round. It was always going to be a tough opening match against Alton and even though the QMC were on home turf at Totally Tennis’ indoor courts they were unable to capitalise on the home advantage and lost 10-2 overall. In the singles, Dingwall played consistently from the back of the court and served well to win 6-4, Irwin lost 6-4 which was not too bad considering he lost the first four games and managed to fight back to level the score at 4-4 but was unfortunately got broken again. Both Speirs and Hutchison also lost with scores of 6-3 and 6-1 respectively. The doubles were a white wash with Irwin/Dingwall losing 6-2 and Speirs/Hutchison beaten 6-3. The team’s second match was away against Bishops Wordsworth School and despite it being held outdoors and not the team’s favoured surface the boys played far more consistently in this match, although they still lost 8-4 there was definite improvement overall. In the singles Irwin played well especially at the net and won 6-2 but his three teammates lost, Dingwall was unlucky after he fought well throughout the match he lost in the tie-break 7-6 (3), Speirs lost 6-4 and despite the scoreline suggesting otherwise Hutchison had close games but lost 6 – 0. Irwin and Speirs won their doubles match 6-4 but Dingwall and Hutchison lost 6-1. In the Mixed doubles Irwin was partnered with Dessi Bratonova while Luke Watts played with Jordan Mosquera. The team’s first match was against King Edwards who the college have been up against in previous years. The match was close, Watts and Mosquera lost 6-1 to top pair but beat pair two 6-3, Irwin and Bratonova beat second pair 6-2 but lost to top pair 6-3 to make things all square. With things all square the match went to a shoot out with only one player from each pair being eligible to play. Watts and Bratonova were selected and played the shoot out, they won the toss and started well winning the first three points in a row to give a commanding lead which they never relinquised, the final score was 10-5. The next and final mixed match will be against Kingston College which will decide the overall group standings. The aim of the Senior Students Competition is to encourage lower rated players to play competitive tennis and provide the team with an opportunity to compete in a National Final. The entry period runs from June – September with local league matches being played October through to December with the winners of the local leagues progressing through to the knockout rounds from January. The National Final take place in March at Bolton Arena. The Queen Mary’s College Girls tennis team who train at Totally Tennis competed in their National Cup fixture away against Alton College. Despite some close matches and good tennis the team lost the singles 3-1 with only Holly Groves winning her match 7-6, 6-1. Unfortunately due to the length of time the singles matches took and the scoreline at that point the doubles was conceded. The QMC tennis team are going to the first day of this year’s Championships at Wimbledon next month. With tickets for Court Two and Centre Court it’s a great way for all the players to celebrate the end of the college tennis season with a day out at a Grand Slam event. 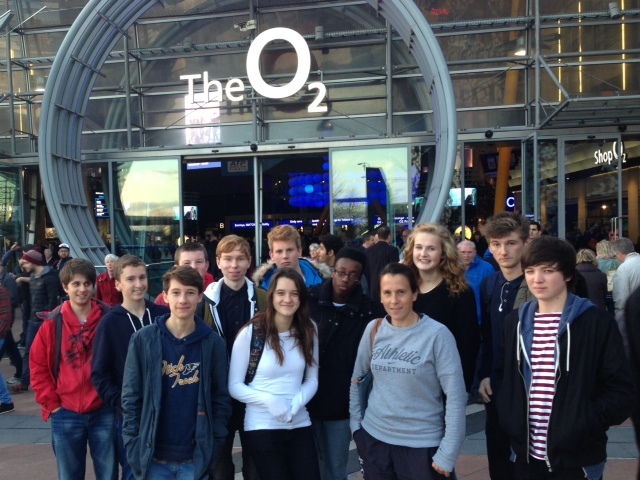 Queen Mary’s College PE teacher and tennis team manager took thirteen of the college’s tennis and former tennis players for an outing to the Barclays ATP World Tour Finals in London last week. A lucky fourteen players, Nick Dingwall, Adam Hood, Luke Watts, Michael Thompson, Joseph Lane, Patrick Lincoln-Ohstrand, Chris Yarney, Sarah Winkle, Kelsey Mosquera, Holly Groves, Ellis Wyles, Harvey Stuart, Ali Olrog and Matt Rennie, accompanied Goldson on the trip to London to watch the world’s top players in action. In an attempt to pacify the obviously disappointed crowd, the organisers had drafted in British number one Andy Murray to return to the O2 and step into the fray to play Djokovic in an exhibition pro-match which Djokovic won 8-5. Murray then paired up with tennis legend John McEnroe to beat Tim Henman and Pat Cash 8-6 in a doubles match. Serbian Djokovic, 27, who only had an incredible eight defeats from sixty-six matches this year collected the ATP World Tour Finals trophy before his exhibition match with Murray.